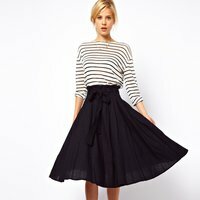 A skirt length that reaches nearly to the ankles, the midi skirt dates to the 1940s. An elegant and flawless classic, it is versatile with a variety of blouses, cardigans and tops. You can easily pull together outfits with a midi skirt that are classy, essential, and trendy. Try pairing the midi skirt with a cute tunic for a retro look. Pull on a cute pair of skinny jeans and a vintage t-shirt for a girly grunge look. Experiment with different boots, heels and sandals to pull together different outfits.